Camy here! Sally Lunn buns or cakes are a famous delicacy in Bath, England, and mentions of it are in documents from the 18th century. Jane Austen may have had Sally Lunns with her tea when she and her family resided in Bath. I scoured Google Books for any Sally Lunn bun recipes from the 18th and 19th centuries. I found several but refined it to the following recipe, which I also adjusted to be used in my bread machine. 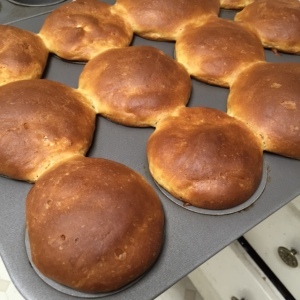 it’s a bit like brioche bread, and can be eaten with savory foods (I cut it in half and put turkey inside) or spread with jam or honey for a sweet breakfast bun. Put the ingredients in the bread machine in the order listed. If after mixing it is too wet, add more flour until it is a light, sticky dough. This recipe can be made in the bread machine on the regular white bread cycle, set for a 2 pound loaf. Alternately, you can put the ingredients in the bread machine and set it on the dough cycle. 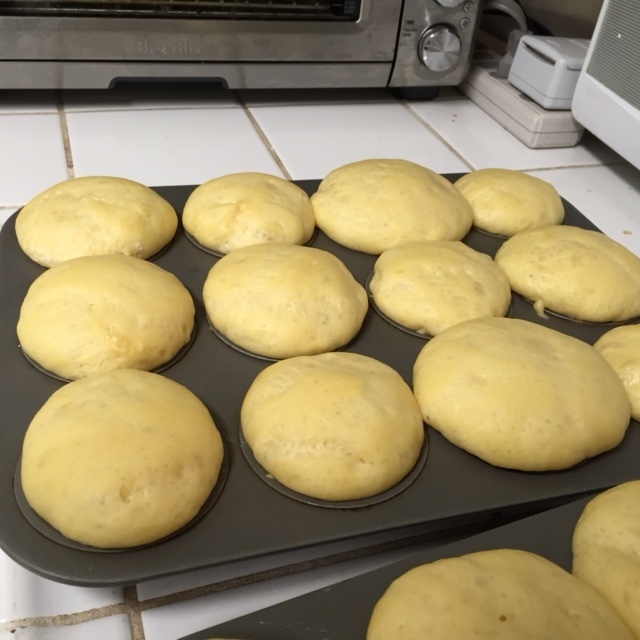 When it has finished the last rising cycle, scoop the dough into well-buttered muffin tins (approx 14-16), filling each well about halfway. Let it rise until doubled, about an hour depending on the temperature in your kitchen, then bake at 350 degrees for 15 minutes. Check after 10 minutes to make sure it doesn’t become too brown. What do you think? If you try this out, please let me know! If you’ve done a fair amount of reading in the regency genre, you’ll have come across a reference to Gunter’s. I’ve seen it mentioned as a place for a chaperoned daytime outing, and as a purveyor of catering for balls and banquets. Studying up on the place, one learns it was founded way back in 1757 as “The Pot and Pineapple”. By the time the regency was in full swing, it was owned by James Gunter. The name was synonymous with the finest in treats., such as ice cream, sweets, and pastries. Being inventive with ice cream flavors tempted more customers. Some extraordinary flavors from those days were jasmine, elderflower, and parmesan, among others. Gunter’s establishment lived on into the twentieth century, but is no longer in existence. It touches me to know that today’s confectioners’ obsession with wild flavors is not unique to our lavish times. Researching some of our latest flavors in 2013 brought to my attention: ale & bacon, salted caramel, pear with blue cheese, lemon basil, and Marsala date flavors. 200 years from the heyday of the regency and we still crave our unusually-flavored ice cream. What’s your favorite flavor? Most unusual you’ve had? Entering my ninth month of pregnancy has had me thinking on the Regency pastimes spent largely indoors – especially those that do not require much by way of physical activity on the part of a typically exhausted, soon-to-be mother of three. My current pastimes don’t venture far beyond the nearest comfortable chair and as such, stay in the realm of reading, writing novels, blogging and time spent on the occasional bout of Facebook posting. This is why a cozy living room or den (aka, a twenty-first century parlor) is such a grand place to kick-back with a cup of hot tea and a delightful Regency Era book. It’s during these relaxing times that a tea-tray and small vase of cheery flowers are particularly welcome companions! 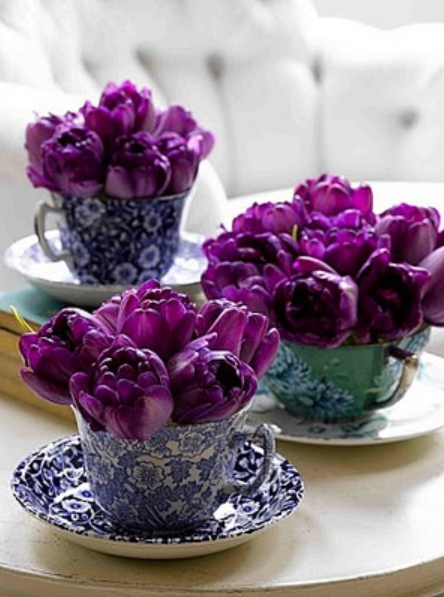 Care for tea and tulips, perhaps? 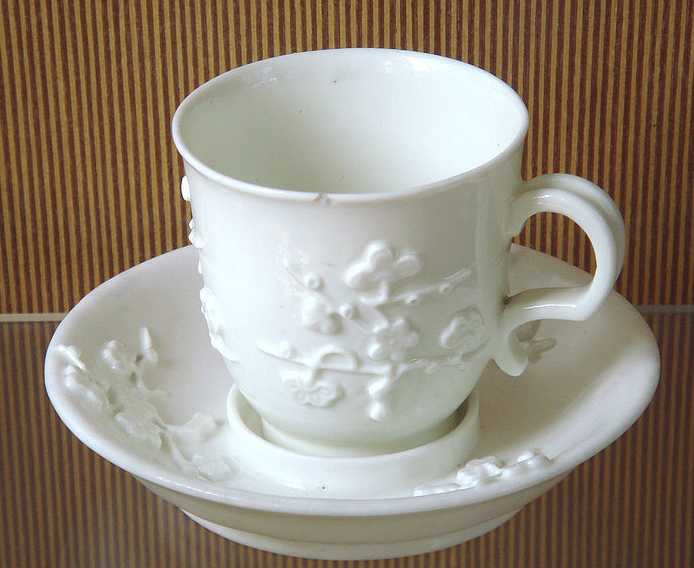 – Cost – The practice of drinking tea had been popular in England for well over a century before the Regency Era, but that did not mean that tea was altogether inexpensive. By the late 1700s, both Thomas and Richard Twining had a great impact on the practice of tea drinking, making it more popular with the opening of a tea shop in 1717 and in the effective lobbying of the government to reduce the high import tax on tea in 1784, which made it somewhat more affordable to the masses (namely, the middle class). The cost remained steady however, due largely to the British East India Trading Company’s monopoly on tea imports up until 1834. – Time of Day/Menu – The definition of “tea time” varied according to the time of day and type of menu items that accompanied the tea itself. Usually served between the hours of 5 and 7pm, the High Tea (also known as the “meat tea”) was identified with the early evening meal. It would have been accompanied by a more substantial hot dish such as shepherd’s pie, baked fish or fish and chips, or other savory dish with baked or broiled root vegetables. While Afternoon Tea (or, “low tea”) did not become the fashion until the early 1840s, it’s still worth mentioning in comparison as the foundation for this tea time was laid during the preceding years. 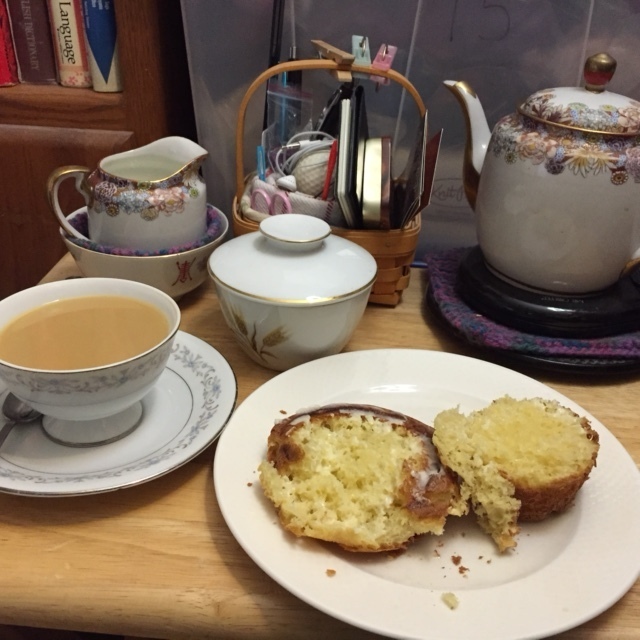 As a lighter version of the traditional High Tea, the Afternoon Tea would have been served to carry one through to the High Tea or later (and more formal) dinner. It would have been accompanied by lighter fare – a snack of finger foods such as seasonal fruit, scones, crumpets, tea sandwiches (cucumber or smoked salmon, for example), biscuits and an assortment of honey, butters, jams, and lemon curds or custard spreads. – Etiquette – Distinctions between High and Low Tea are commonly referenced to the height of the table used for tea service (though this is not the only distinction noted from multiple sources). 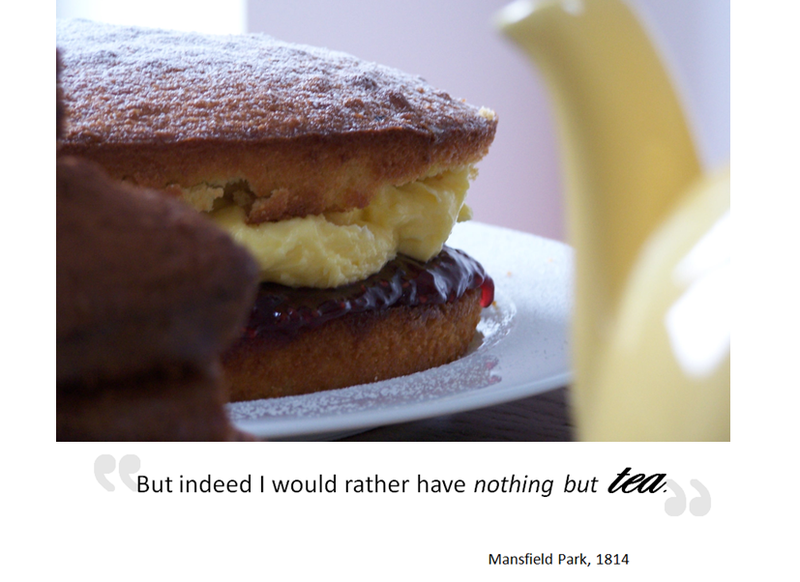 Light Afternoon Tea would have been served outdoors in hospitable weather, either in a garden or at picnic. 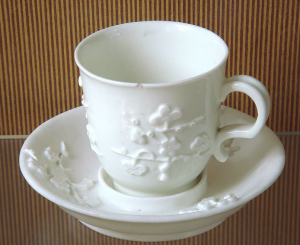 Indoor tea times would have been served in a less formal setting such as a parlor, study, or salon, and on the low coffee tables often found in these rooms. 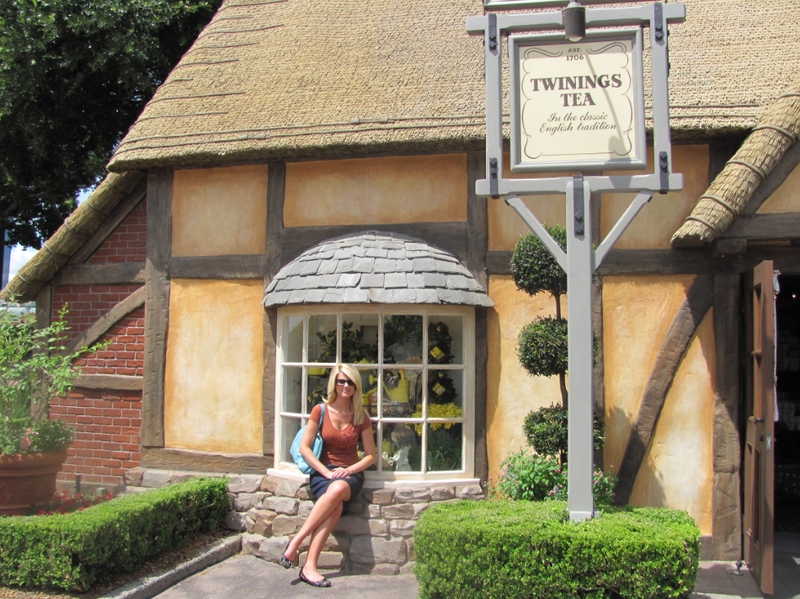 – Tea Tidbits – It’s interesting to note that “taking tea” was actually a rather ill-mannered expression at the time. One would have opted for referring to High Tea time rather than the more uncultured phrase. Here’s another tidbit just to make you smile… Though our post is titled to Tea and Tulips, we’re of course referring to the lovely blooms that appear in our window boxes each spring. But in the Regency Era, the word Tulip actually referred to a “fine fellow who dressed quite well”. With all the tea talk we’ve had, I’m feeling more relaxed than ever. 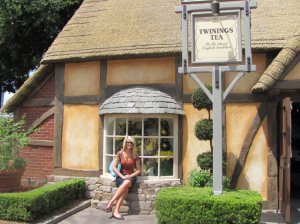 Between the writing and blogging, tea time that is High or Low, and the service in our parlors or salons, I’m ready for a honey-sweetened cup of Twinings best on my own tea-tray. So what’s my Tea and Tulips moment? It’s in the smiles of my children and the care bestowed by my husband that has this soon-to-be mom of three rejoicing. After all, no matter what flavor of tea or time of day, God’s blessings are always on the menu. What tea flavors your day?